[XPB-2903-28] The Aerix™ Automatic Hand Dryer features a infrared sensor that is operated by a selinoid . 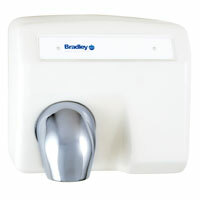 Aerix hand dryers are surface-mounted construction. The Commercial Bathroom Aerix uses 80% less electricity and dries 3 times faster than conventional hand dryers. The automatic hands free Aerix model features Cast Iron construction with a a with White Epoxy Finish and designed with universal voltage for easy installation. Specifications and detailed information available upon request. For shipping quotes, orders or questions please call our Customer Service Center at 1-877-483-9270.